Performers include: Ben Cross, Joanna Going, Joseph Gordon-Levit, Jim Fyfe, Roy Thinnes, Barbara Steele, Barbara Blackburn, Jean Simmons, Veronica Lauren, Julianna McCarthy, Michael T. Weiss, Stefan Gierasch, Michael Cavanaugh, Ely Pouget, Lysette Anthony, Eddie Jones, Ellen Wheeler, Steve Fletcher, Rebecca Staab, Adrian Paul, Wayne Tippit, Apollo Dukakis, and Brendan Dillon. Searching for treasure, dim-witted groundskeeper Willie Loomis (Jim Fyfe) opens the Collins family crypt in the seaside town of Collinsport, Maine. In doing so, he accidentally frees 200-year-old vampire Barnabas Collins (Ben Cross) from his chained coffin. Barnabas passes himself off as a distant relative from England to the residents of Collinwood (the family mansion) and begins feeding on the local townspeople. 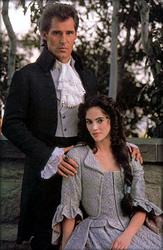 He immediately falls for the family’s new governess, Victoria Winters (Joanna Going), who closely resembles Josette, his love who died many years ago. Also living in the mansion are matriarch Elizabeth Collins (Jean Simmons), her brooding brother Roger (Roy Thinnes) and his incorrigible son David (Joseph Gordon-Levitt). Dr. Julia Hoffman (Barbara Steele) learns Barnabas’ secret, falls in love with him, and offers to cure him of his vampire curse. After a few episodes, the story begins to alternate between present-day and 1790 Collinsport where each of the characters has a counterpart. This primetime drama is based on the 1960s Dark Shadows gothic daytime soap opera. I had never heard of Dark Shadows until the 1991 revival aired and I loved it. To this day I resent NBC for cancelling it. I have since become a fan of the original series as well. I recently saw the 2004 WB pilot and for the most part I thought it was great. The atmosphere and acting were great. It was creepy, gothic, and scary and really both respected the legacy of Dark Shadows and brought it into the 21st century. I hate the 2012 film as it is a comedy. Dark Shadows deserves another respectful, serious revival!